Eternal Orthodox Church calendar for the 20.10 year 2017. 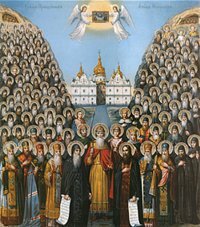 These holy and wonderful martyrs and heroes of the Christian faith were at first nobles at the court of the Emperor Maximian. The Emperor himself valued them greatly for their courage, wisdom and zeal, but, when he heard that these great nobles of his were Christians, his love for them turned to fury. And once, when there was a great offering of sacrifices to idols, the Emperor summoned Sergius and Bacchus to offer sacrifice together with him, and they openly refused to obey him in this. Beside himself with anger, the Emperor ordered that their robes, rings and marks of eminence be stripped from them and they be dressed in women"s clothing. He then put iron yokes on their necks and led them thus through the streets of Rome, to be mocked by each and all. The Emperor then sent them to Asia, to Antiochus the governor, for torture. Antiochus had achieved his distinguished rank with the help of Sergius and Bacchus, who had at one time recommended him to the Emperor. When Antiochus began to urge them to deny Christ and save themselves from dishonourable suffering and death, the two saints replied: "Both honour and dishonour, both life and death - all are one to him who seeks the heavenly Kingdom." Antiochus threw Sergius into prison and ordered that Bacchus be tortured first. The servants took turns in beating holy Bacchus until his whole body was broken into fragments. His holy spirit went forth from his broken and bloodstained body and was borne to the Lord by angels. St Bacchus suffered in the town of Varvallis. Then holy Sergius was led out. Iron shoes studded with nails were put on his feet, and he was driven out into the Syrian town of Resapha, and there beheaded with the sword. His soul went to Paradise where, together with his friend Bacchus, he received the wreath of immortal glory from Christ his King and Lord. These two glorious knights suffered for the Christian faith in about 303. Born in the district of Gampnanitus of peasant parents, he worked as a young man in the vineyard of a Constantinopolitan man, giving himself to fasting and prayer day and night. Seeing his way of life, angelic in its purity and restraint, the overseer was amazed and gave him far higher wages than they had agreed. St Polychronius used the money to build a church. 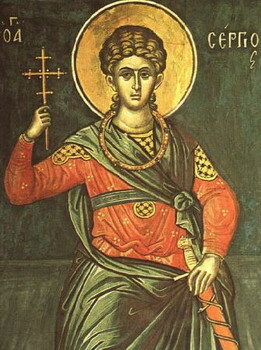 At the time of the Council of Nicaea in 325, Polychronius was a reader and showed such zeal in the defence of Orthodoxy against the Arians that he was ordained priest. Later, these wicked heretics, out of revenge, fell on St Polychronius in the church itself and cut him to pieces. 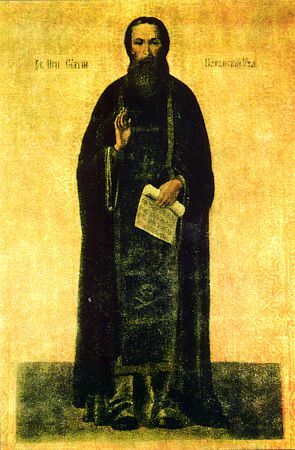 Thus suffered this great defender of the truth and purity of Orthodoxy, and received the wreath of glory from his most glorious Lord. In the Greek Synaxarion there are also commemorated today the ninety-nine ascetics of Crete. It is said that the hundredth never joined them, which was interpreted as meaning that the hundredth was Christ the Lord Himself, their leader. 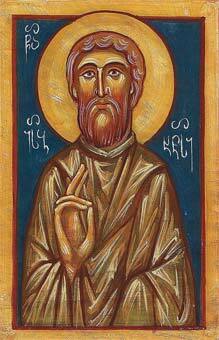 The most renowned among them was St John, a great man of prayer and a wonderworker. He prayed so much kneeling that he was in the end unable to stand, but moved around on his knees. Seeing him going about like this, a woodcutter thought that he was a wild beast and shot him with an arrow. Then a very great wonder was wrought, for all the rest of the ninety-nine ascetics breathed their last on the selfsame day. It is not known when they lived. 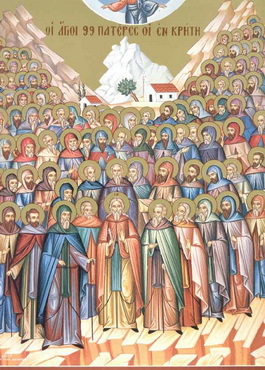 The Holy Martyrs Julian the Presbyter and Caesarius the Deacon suffered for Christ in the I Century. Saint Caesarius was thrown into prison in the Italian city of Terracinium for insulting the pagan gods. They later took him bound to the temple of Apollo, but before they got him near the pagan temple it collapsed, killing the pagan priests and many of the people. At about this same time the idolators arrested the Christian priest Julian. By order of the emperor, the holy martyrs were cast into the sea, but their bodies floated up, and Christians buried the sufferers. The relics of Saint Caesarius are situated at Rome. Martyrs Eusebius, presbyter and Felix, suffered together with Sts. Julian and Caesarius whom we commemorate today. They were beheaded. In the hand-written books of the saints the Ven. Sergius is called the "Faster". He practiced asceticism in the Kievan Monastery of the Caves in the XIII Century. His relics are in the St. Anthony cave.